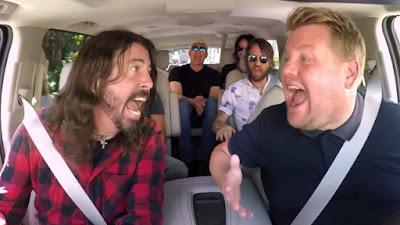 The Foo Fighters rocked classics old and new during their appearance on the latest installment of "Carpool Karaoke" on CBS-TV’s The Late Late Show with James Corden, and video from the program is available online. On the late night program to promote their newly-released ninth album, “Concrete And Gold”, the Foos joined Corden for his ride to work while singing along with some of their classic tunes and tracks from the latest record. Along the way, a discussion about drumming turned into an audition for the host as they pulled into a local Guitar Center to test out some gear. The Foo Fighters will launch their ninth album with a fall US tour that will begin with their own Cal Jam 17 festival at Glen Helen Regional Park in San Bernardino, CA on October 7, which will feature more than a dozen acts, including Queens Of The Stone Age, Cage The Elephant, Liam Gallagher, Royal Blood and more.